The popularity of our meals is found in our respectful approach to the meal recipients and our broad vision of community, which separates Meals From the Heart food from other providers’ products. To better serve moms, dads, and children, we believed from the start that our meals had to be transformed beyond a tasteless bag of rice or pasta that simply met basic nutrition guidelines into flavorful enhancements a family can enjoy eating. Our meals are developed by a consulting chef to deliver all the essential nutritional requirements in recipes that actually taste good! 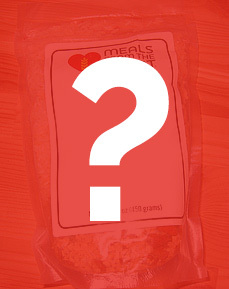 We don’t think that a meal for a hungry person needs to be bland. The meal packaging also better reflects a typical commercial product to communicate our respect for the end consumer; the bag design stands up on a shelf to assist our distributors and makes selecting the package easier for families. 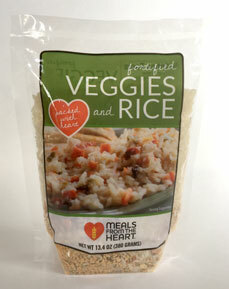 Our Veggies and Rice is appropriate for both domestic and international distribution whereas the others are designed for the U.S. domestic palate and nutritional needs. 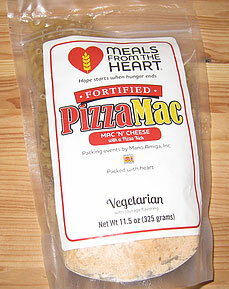 Pizza Mac is a macaroni and cheese dinner with a “pizza kick.” The cheese is a three-cheese blend and the sausage flavor comes from textured soy, which means all our meals are vegetarian. 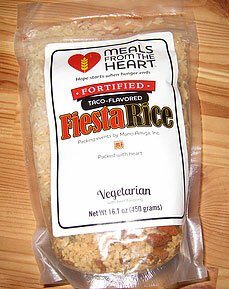 The taste of Fiesta Rice will remind you of tacos and has a beef flavored textured soy. Our domestic products were created with the help of an accredited chef. They taste really good! We’re always working with our chef to develop new flavors and recipes. Have an idea for a delicious new taste?